Pan-fried catfish fillets are one of my favorites. 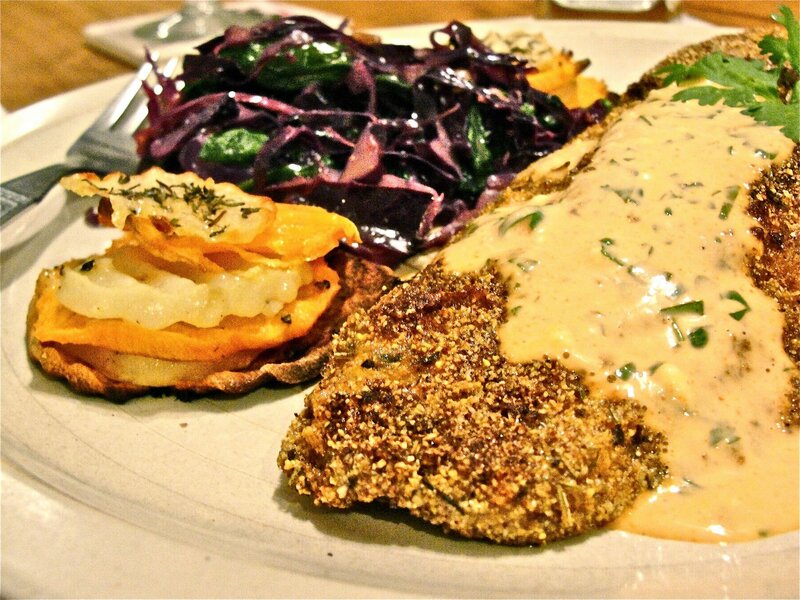 Here the catfish is dipped in an egg/milk wash and coated with cornmeal, seasoned with crushed rosemary, oregano, thyme, turkish paprika, cayenne powder, salt and pepper and pan-fried. Topped with a sauce of mayonnaise, hot pepper sauce, minced cilantro leaves, and lime juice. Accompanied by roasted potato stacks (sweet and russet potato, with olive oil, garlic, salt and peper, sprinked with thyme leaves) and sautéed red cabbage and spinach, with pine nuts, and tossed with a mustard vinaigrette dressing (olive oil, balsamic vinegar, dijon mustard, honey, garlic, and black pepper). UPDATE (March, 2014): Here’s another nice version from ThingsMyBellyLikes.com!